Not long ago, Silkie the hen had four friends. Princess Leia sadly succumbed to old age, and Dorothy Vader may have been the victim of a fox, mink or rebel blaster ( it is hard to tell which… all we found of her was a few black feathers). Red-feathered Freddie Weasley (probably still mourning the ironic demise of her twin sister, Georgina) wondered off into the wilderness (the field beside our house) and never returned. Luke Skywalker is still alive. She comes back occasionally, pecks around disdainfully and goes away again. We think she has a clutch of eggs hidden somewhere and clings to the mistaken belief that they may one day hatch. In the meantime, Silkie, the sole inhabitant of a once lively hen house, is lonely. She pecks around the garden disconsolately. She arrives at the front door each morning and stares up at our windows, giving the occasional mournful cluck. She stands on the porch and makes us feel irrationally guilty every time we get into the car and drive off without her. Silkie’s loneliness is such that she has taken refuge with the goats. When she is not laying guilt trips at our feet, she sits with them, sometimes sharing their food and probably discussing the fickleness of hens named after fictional characters. 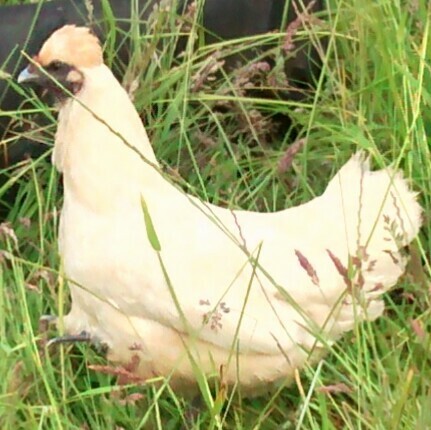 I am writing this, because I am tired of feeling responsible for a hen’s social life and would sincerely like to get Silkie the companion she needs. If anyone has a hen, or knows a hen that needs a new home, please let me know. I will point out that I live in Offaly, Ireland, so offers of hens more than 30 miles away are unlikely to lead anywhere, although the thought is gratefully appreciated. A hen that lays eggs at least sometimes would be preferable. After all, eggs are why we got the hens in the first place. I feel the irony of that statement every time I buy a carton of them in Aldi. I hope she gets a friend. 🙂 Lovely story, too.